Stressed students often leave belongings at the TECH Center while studying, but employees save all lost items in a box underneath the Help Desk. 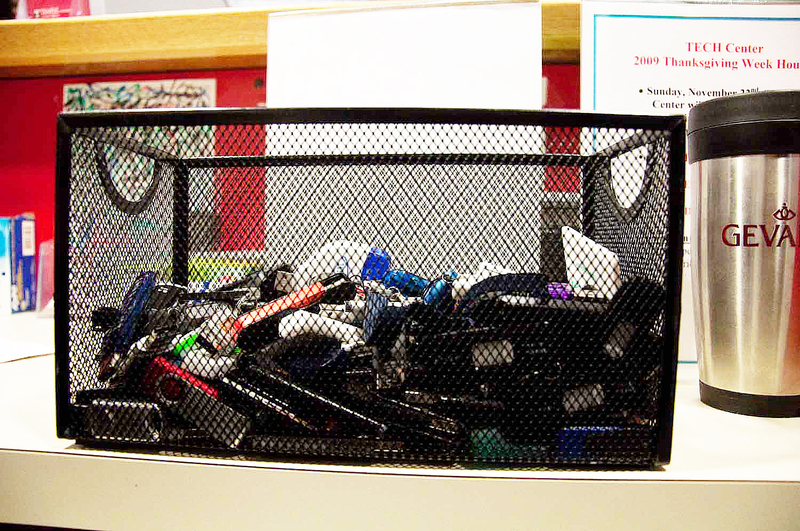 COLIN KERRIGAN TTN Flash drives lost in the TECH Center find a home in a large storage bin at the Help Desk. Students can reclaim them by identifying their size, design and content for verification. With the stress of finals upon them, students can be more forgetful. Some students forget to eat breakfast, charge their cell phones or take their flash drives with them from the TECH Center after printing countless final papers at the end of the semester. TECH Center employees collect missing USB flash drives that many students leave behind. In most cases, those thumb drives are loaded with important and private information, such as students’ documents, photographs, music and videos. Sophomore kinesiology major Brigid Lyons said she considers herself lucky, having recovered her missing flash drive after she left it plugged into a TECH Center computer last Thursday. On it, she had stored two important papers and a class journal. Lyons said she was “freaking out” when she got home and realized she left her flash drive at school. The TECH Center staff members regularly collect thumb drives left behind. They’re then put in a storage box underneath the Help Desk. When a student comes to claim his drive, he may be asked to identify its size, design and content in order to verify its ownership. Director of Information Technology at the TECH Center Gene Mayro said an employee may open a document inside the drive to compare the name with the claimant’s. After a while, though, Mayro said the USB drives are turned over to Campus Safety Services’ lost and found office if students haven’t picked up them up. CSS has its own retention policies for lost articles. Freshman biology major Ruturaj Rana said he also came close to losing a flash drive in the TECH Center. “I almost had a heart attack,” Rana said, adding that his school documents, PowerPoint presentations and final papers were all stored on the thumb drive he nearly lost. From then on, Rana said, he has been careful to remember to check the area before he leaves. He also takes necessary precautions by saving his work to his laptop’s internal hard drive and e-mailing the file to himself. But USB drives aren’t the only items commonly left behind in the TECH Center. Junior elementary education major Katie Karch said she had a brief scare last month when she realized hours after leaving the TECH Center that she left her cell phone at a computer. “I got up from the computer in kind of a hurry and went on with the rest of my day, and about five hours later, I realized my cell phone was gone so I came back to check that area, but it wasn’t there,” she said. Karch said she went to the front help desk and was asked to identify her cell phone before it was given to back to her. Mayro said he is frequently a witness to students’ relief when they get lost items back. What every freshman should know right off the bat. I bet the people that work at the Tech Center have a ball with this and go thru everything, and probably even pocket a few flash drives and all.